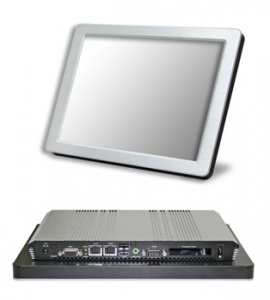 Avalue is releasing a new LPC-1203 Touch Panel PC that is aimed at applications in marine and extreme environments. The LPC-1203 achieves full IP65 compliance, which means it can withstand overall splashing conditions, and it benefits from a variety of innovative technologies. This year the product is also honoured by the Taiwan Excellence Award 2010. With low power consumption, the LPC-1203 is powered by Intel's Atom N270 processor, which reduces the power demand and saves operating costs. The reduced thermal energy makes the fanless computer a high safety and 'green' product. At same time, the LPC-1203 has an innovative embedded heat dissipation trench design that enables system-generated heat to dissipate quickly. Other than speeding heat dissipation, the aluminium chassis also protects the computer when it is used in more humid environments, such as factories or test laboratories, thereby ensuring the computer operates reliably and stably. The entire computer is water-proof, including the front panel, rear data transmission connectors and power sources. Furthermore, the computer combines a rear heat-dissipation aluminium case and novel I/O connectors to improve resistance to the ingress of dust and moisture compared with other panel PCs, and enhance the convenience and safety for extreme environment applications. In addition, using the modular system-on-module design concept, the LPC-1203 supports diversified performance levels such as COMe/ETX CPU modules and lower scalable baseboard, also enabling users to group the boards according to individual needs. The modular design makes the computer price-competitive so users can choose system requirements freely and upgrade the panel PC at any time to extend the product life. Based on a versatile architecture and diversified I/O design, the LPC-1203 features serial port connectivity for industrial controls. The LPC-1203 utilises low-refractive touch panel technology, which reduces refraction between the panels and makes the display brighter when used outdoors. In addition, a Super anti-abrasion coating prevents scratches and increases durability. The LPC-1203 comes with a 12-inch touch panel LED backlit screen that supports resolutions up to 1024x768. Its LED backlight reduces heat generation, thereby reducing power consumption and cost, and prolonging the panel lifetime.